This review reveals that Verified Robot is a cryptocurrency scam that is meant to lose your money. Verified Robot is an automated trading solution for cryptocurrencies. This robot will generate trading signals and execute them on your account. Verified Robot allegedly has an 86.53% average win ratio, which means that it should be able to make you a lot of money in a short period of time. First of all, an 86.53% win ratio means nothing, because we are not talking about binary options. Cryptocurrencies are traded either directly or via contracts for difference (CFDs). So, it all depends on your stop losses and take profits. For example, if your take profit on each trade is 1 percent, but your stop loss is at 10 %, one losing trade will erase 10 winning trades. With such ratio even an 86.53% win rate would make you lose money. This shows that scammers who put up Verified Robot have no clue about real trading. The tangible proof that Verified Robot is a scam is in the software. It uses a well-known scam robot that has been around for years, we have seen it countless times. 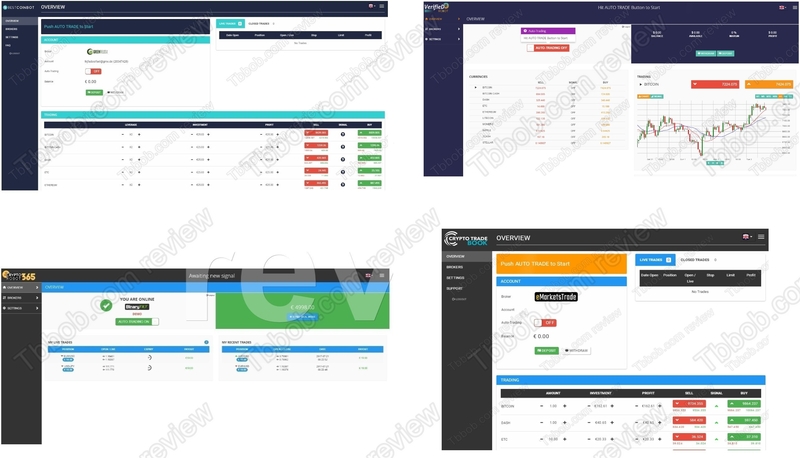 Check our picture that the same software is used for example by Best Coinbot, Crypto Robot 365 and Crypto Trade Book scam. This software sometimes allows you to test it in a demo mode, but that demo is forged, it uses fake prices to generate fake profits that would not happen in real trading. So, be careful! Verified Robot is made to make you sign up and deposit with the unregulated broker Ashford Investments. People who run the robot are paid by this broker for every new depositor. This is how it works, this is their motivation, they make money on referrals. And they use lies about a profitable robot, so that you deposit and make them earn their commission. Verified Robot is a simple scam that will make you lose money with a crappy robot and an unlicensed broker. Stay away from it! If you want to make money with cryptocurrencies, open a free demo with a regulated broker and start testing and learning how to trade. Be sure to prepare a good strategy and understand all the risks before you invest real money.